American Faces Trial In North Korea - kaycee Weezy! A US citizen will be tried soon on charges including attempting to overthrow North Korea's government, the North's official news agency says. 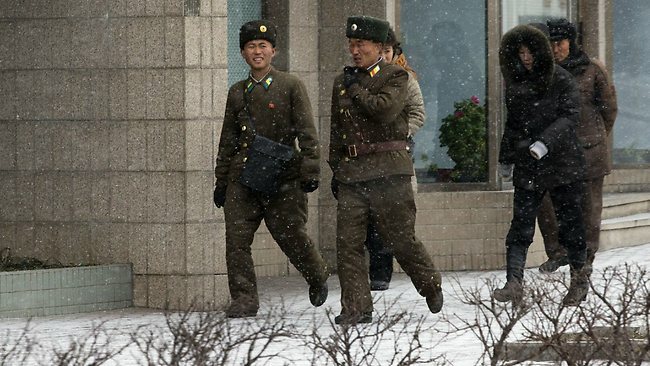 KCNA says that Pae Jun-Ho has admitted the charges, without specifying when the verdict will be handed down. His case comes at a time of high tension between Pyongyang and Washington. This follows North Korea's third nuclear test in February. "The preliminary inquiry into crimes committed by American citizen Pae Jun-Ho closed," the KCNA said in a report on Saturday. "In the process of investigation he admitted that he committed crimes aimed to topple the DPRK (Democratic People's Republic of Korea) with hostility toward it. "His crimes were proved by evidence," the report added. "He will soon be taken to the Supreme Court of the DPRK to face judgement." It is not clear what sort of sanction Mr Pae, 44, might face, although North Korea's criminal code provides for life imprisonment or the death penalty for similar offences. Mr Pae, believed to be a tour operator of Korean descent, is the sixth American detained in North Korea since 2009. Former Presidents Bill Clinton and Jimmy Carter as well as former UN Ambassador Bill Richardson have all been involved in mediation efforts to gain the release of previous American detainees. In one of the most high-profile cases, Mr Clinton negotiated the release in 2009 of two US journalists, Laura Ling and Euna Lee, who had been found guilty of entering North Korea illegally. "For North Korea, Bae is a bargaining chip in dealing with the US," Koh Yu-hwan, a professor of North Korean Studies at Dongguk University in Seoul told Associated Press news agency. "The North will use him in a way that helps bring the US to talks when the mood slowly turns toward dialogue,'' he said. Mr Pae was reportedly arrested in November after arriving in Rason - a special economic zone in the north-east of the country near the Russian border. The complex, once considered a symbol of reconciliation, lies just north of the military demarcation line dividing the two Koreas.